Two Tribes is a name that will be familiar to many a Nintendo fan after the excellent Toki Tori series, a puzzle platformer with some very light Metroidvania elements. 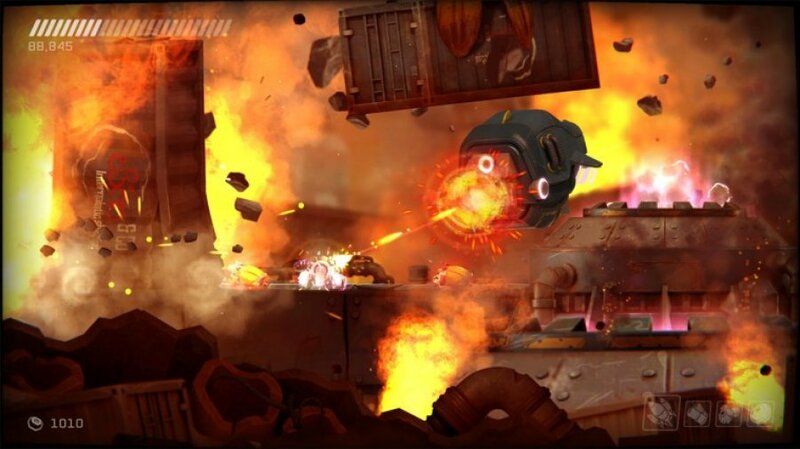 Since producing those games, the company fell on some hard times and stated that RIVE would be its final game. The title was announced back in 2014 for the Wii U, and now that it’s finally out on the Switch, the question remains: is it a fitting swan song for the studio? 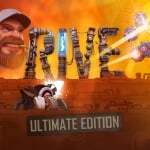 In RIVE: Ultimate Edition, you play as the irreverent pilot of a powerful spidertank, who finds himself trapped in a derelict space vessel ruled by a rogue AI. These two interact with each other frequently through the game, spouting one liners and self-referential jokes that admittedly fall flat most of the time, but nonetheless help keep things lighthearted. You jump, fly, and shoot your way through swarms of enemies, saw blades and various other death traps in an attempt to escape, all the while picking up bolts for ship upgrades. It’s pure arcade action, and between the difficulty and the depth of content on offer, there’s a lot to keep you coming back. Gameplay takes the form of a twin stick shooter, with the shoulder buttons being used to jump and shoot and the sticks being used to move and aim. Though the ship you’re exploring is technically all one big connected map, you’ll be taking it on in small chunks via a mission-based structure that sees you warping to different sections. Exploration doesn’t play much of a role here, as you’ll be funnelled along a relatively linear path that is positively saturated with things trying to kill you. Most enemies are of the suicidal variety that crash into you at high speeds, but there’s a great amount of diversity to the enemy types as the game continues, often necessitating a change in tactics. Constant movement is absolutely essential to survival as you weave your way through swarms, dropping the machines like flies. The controls and physics are spot on, which makes for an exceedingly fun experience that rewards pure skill and punishes anything less. Your gun admittedly isn’t all that powerful, which demands that you step up your aim, but this can be sidestepped by the four unlockable consumable weapons that are far more useful for crowd control. You can utilise things like shotgun blasts and missile salvos to rain down death on your enemies, and it’s quite satisfying to line up that perfect shot and clear out a dozen enemies in one blast. 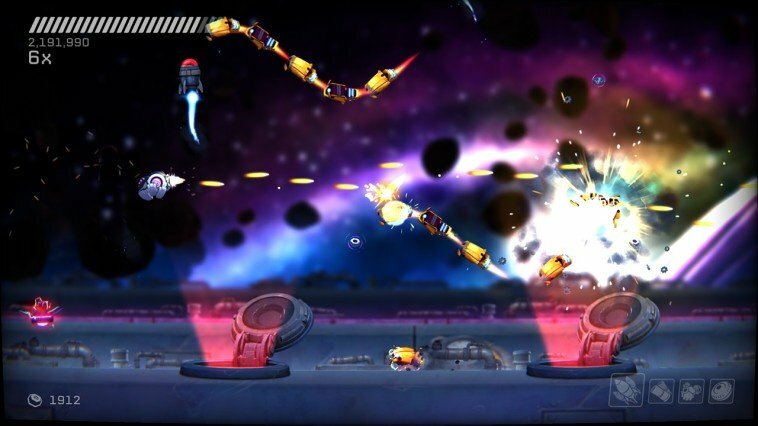 In addition to all the traditional weapons, RIVE also features a gimmick that allows you to hack certain enemy types and have them fight for you on your side. From a hovering healing drone to another machine gun, the benefits these hacked robots offer are quite welcome and can often be the deciding factor that tips the tide of a battle in your favour, though it does feel like this aspect of the game is a little underutilised. There’s a small handful of hackable robots and they only show up every once in a while, so you’re on your own for much of the time. 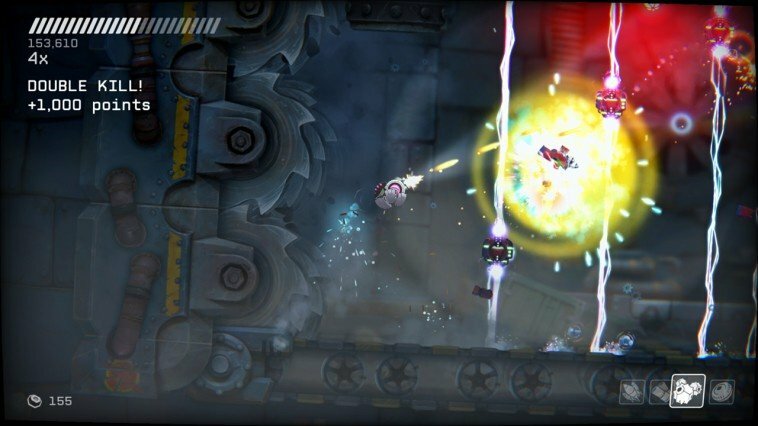 This isn’t a serious drawback, but given RIVE's high difficulty, every little thing that helps is greatly appreciated. Even on its “easy” difficulty mode, you’ll find yourself dying a lot in RIVE. Enemies are absolutely merciless in their pursuit to destroy your spidertank, and one mistake in battle tends to have a compounding effect. Miss one enemy in a swarm and it’ll crash into you, sending your tank careening into a saw blade which will then bounce your tank into another swarm of enemies that immediately ends you. Fortunately, checkpoints are plentiful and often save your progress right before a big fight, so you rarely have to do much to have another go. This is a great way of going about high difficulty, as it tests the player’s skill level and gives them every chance at trying as many times as it takes to win. You might die a lot here, but there’s no lives system or wonky checkpoints to introduce needless frustration to an already stressful game. Now, the Switch version is given the “Ultimate” moniker, and that’s for a number of reasons. For one thing, there’s a co-op mode that takes advantage of the split Joy-Con which allows one player to pilot and another player to man the gun. When you die, the controls switch between the players. This can lead to some hectic sessions for sure, but it adds an extra layer of enjoyable chaos to an already chaotic game. RIVE also features some excellent HD Rumble, which adds an extra layer of punch to the action on screen. Every exploding enemy causes the controllers to shake violently and even smaller things like a bullet hitting the tank’s hull or landing on the ground after a long jump will cause minor vibrations in the controllers. It’s like actually being inside the spidertank; the developers did a great job of nailing the finesse of HD Rumble. When it comes to replayability, there’s plenty more here than just the few hours it’ll take to clear the main story mode. There’s a single credit mode that tasks you with taking on challenge runs or the story mode with only one life. There’s a challenge mode that adds on special rules to small levels, forcing you to fight only a particular enemy type or to fight off a wave of enemies with no special weapons. There’s a battle arena mode that drops you into a number of different arenas to fight off a near endless wave of enemies. There’s no shortage of things to do beyond the main mode, and all of this feeds into an in-game achievements system that rewards certain types of play and hitting milestones. As long as you’re a twin stick shooter fan, you won’t get bored of RIVE for a long time. From a presentation perspective, RIVE hits it out of the park. 60 fps whether docked or undocked makes for a buttery smooth experience, and 1080p output docked and 720p portable means that it all looks quite sharp in motion. 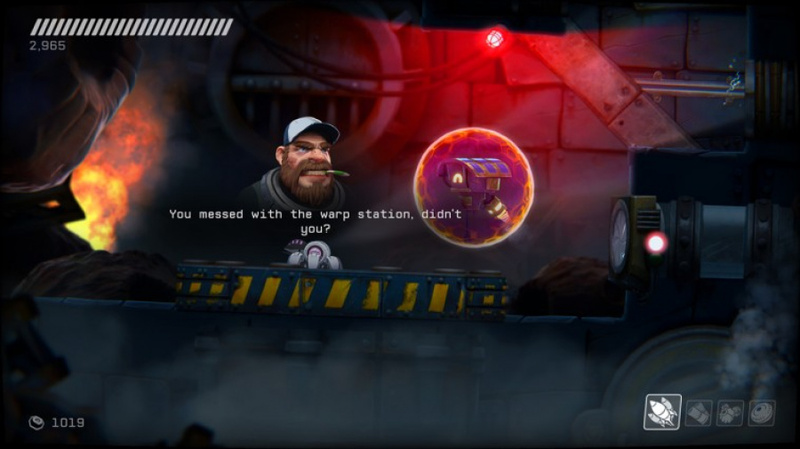 Though RIVE isn’t too colourful given the industrial setting, it still knows how to put on an eye-catching show. Explosions are bright and shake the screen, making it hard to pull your eyes away from the action as it unfolds. And all of this is backed by an upbeat, pulse-pounding soundtrack that helps to keep the pace moving at a steady clip. 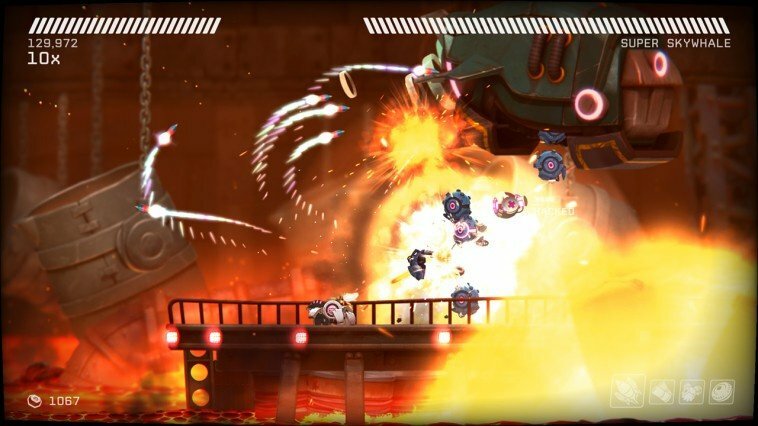 All told, RIVE is a fantastic addition to the Switch eShop and stands as an amazing twin-stick shooter. Incredible presentation, tight gameplay, high difficulty, and lots of replayability combine for an unforgettable experience that we would highly recommend you check out. Two Tribes has outdone itself with its final game and although the company will be sadly missed, it couldn’t have gone out with more of a bang. Fantastic! I'll pick it up once I get the chance. It’s an awesome game , everyone should buy it. the Wii U demo was awsome! Still have nindie demo installed on my Wii U. It was well worth the wait, another brilliant must have on the eShop. Absolutely loved this game didn't even wait for a review. Knew after the Nndies @home preview it was something special. Had a ton of fun playing this with a friend on hard but to beat the campaign I had to do it solo. Also some challenges are time locked and continue to be accessible over a few days. Great game overall and definitely agree with the score. Brutal at times but in a good way. I didn't wait for the review either. It's brilliant stuff. I’m glad it reviewed well, but I’m not really a fan of twin stick shooters. Nice. Been intending on supporting Two Tribes and their last game since the Wii U Version was announced. It's great to see them exit on a high note. Should be some serious fun had with Rive soon. Didn't initially intended to buy at launch, too many expensive purchases close to each other on the Switch, but the price plus what I've played on the WiiU demo was hard to pass! Thanks for the review and nice to read all these comments. Awesome! Thanks guys! Maybe we can tempt you to stick around a while longer? Anyway, thank you for what you have given us and good luck to any of your future endeavors! I would like to have the option to assign buttons as well. I knew this game was going to be great, it has Two Tribe's name on it after all! I enjoyed this when they had the demo out on Wii U and am happy to see it finally make it's way to the Switch. Nice to have an early bird discount. This review seals the deal. Never finished a TT game but I bought them all. Why are they closing down? Financial issues? I double dipped for this, a great game all around. Two Tribes' last hoorah (for now...?) has been an amazing one indeed. I feel like they found something when doing this game. Glad to see it's turned out well. The demo didn't really click with me but I'm sure it's come a long way since then. I've really enjoyed Two Tribes games in the past, I'm sure this will be no different. @TwoTribes Brilliant game and an absolutely perfect for the Switch. All the best for whatever the future brings. @TwoTribes You guys certainly did an outstanding job here, we'll miss you! This game is a steal at $12.75 for the presentation and challenge. That FRAME RATE with constant animation and a bazillion sprites and explosion effects on the screen at any given moment shows that indie devs who KNOW WHAT THEY’RE DOING can port a game to the system and make it look fantastic!!! @TwoTribes Rive is a bomb!!! Thanks for all love you have put in it. A 9 or 10/10 for me. The graphic, the gameplay, the challenge are all awesome! Great game nice graphics interesting and challenging gameplay, very fun cooperative mode, overall 9/10 because there just aren't enough of those brilliant and addictive levels.